When I lived in El Paso, I used to sing this modified nursery rhyme to myself when it would rain. I love when it rains (or at least when I’m dressed appropriately and have an umbrella!). It never rained quite enough for me in El Paso. Rather, it hardly rained at all. One of the major reasons I wanted to return to Michigan was to have four seasons again. El Paso didn’t really have a proper fall or winter (it was mostly just summer and fake winter) and we barely got rain. If we were lucky enough to have rain it either a) stopped after 10 minutes or b) flooded the entire city. Because it rained so scarcely, no one ever knew how to deal with it. There wasn’t much sunglass wearing from me today! It has been raining all day. I’ve certainly been enjoying the rain, but today I was not prepared for it at all! I went out wearing sandals… At least I had an umbrella? It was a perfect rainy day to curl up with a cup of tea and a good book; if I didn’t have to work. 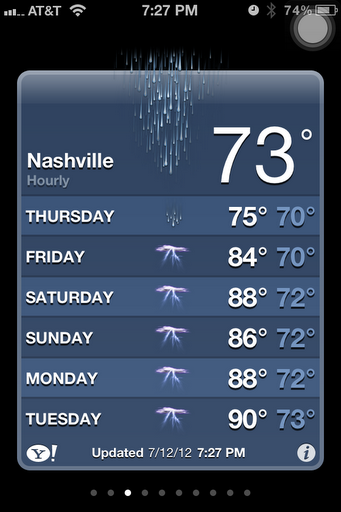 It looks like I will be getting plenty of opportunities the next couple of days to have rainy days!